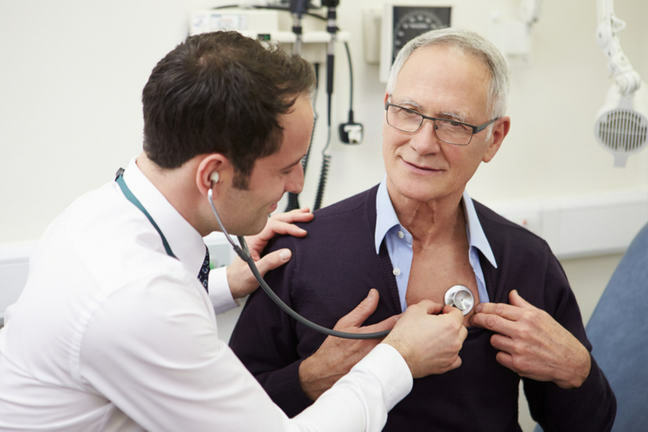 Chronic obstructive pulmonary disease is a highly prevalent condition characterized by airflow obstruction that reduces the ability to sufficiently empty the lungs. In the following two steps we look at exercise intolerance in this clinical cohort, talk about the benefits of exercise, and present exercise guidelines. Exercise intolerance is closely linked to impairment/disability and is a stronger predictor of poor quality of life and survival than either lung function (measured by spirometry) or levels of blood oxygen. We will now look at the key concepts associated with exercise intolerance in COPD; dynamic hyperinflation of the lungs and peripheral muscle dysfunction. For individuals with normal lung function, the end-expiratory lung volume decreases by approximately 200 to 400 ml with moderate exercise. 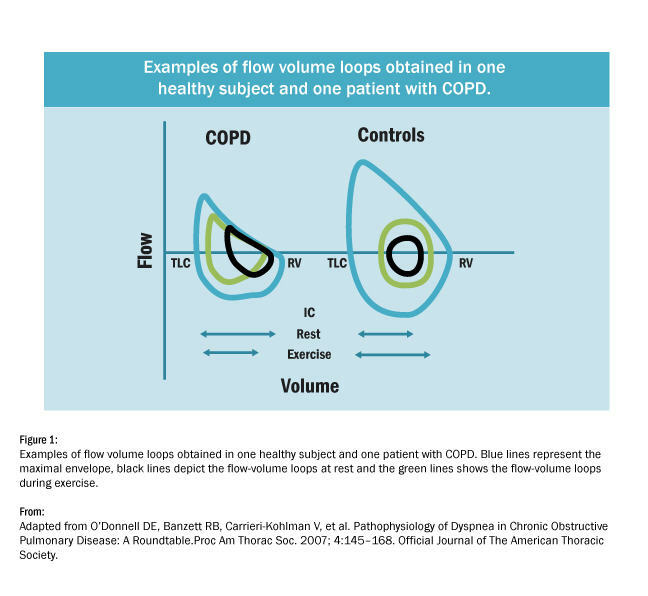 In contrast, in patients with COPD, expiratory flow is limited at rest, and when breathing frequency is increased during exercise they have less time to breathe out. 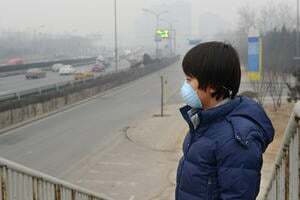 So, air is accumulated in the lungs increasing end-expiratory lung volume and reducing inspiratory capacity. This is called dynamic hyperinflation of the lungs (Pepin et al, 2007). As you can see from in diagram below, the end-expiratory lung volume in the control or healthy participant is reduced during exercise (green line) compared with rest (black line), whereas it is increased in the participant with COPD. This dynamic hyperinflation leads to diaphragm weakness and may contribute to dyspnea and reduced exercise tolerance. 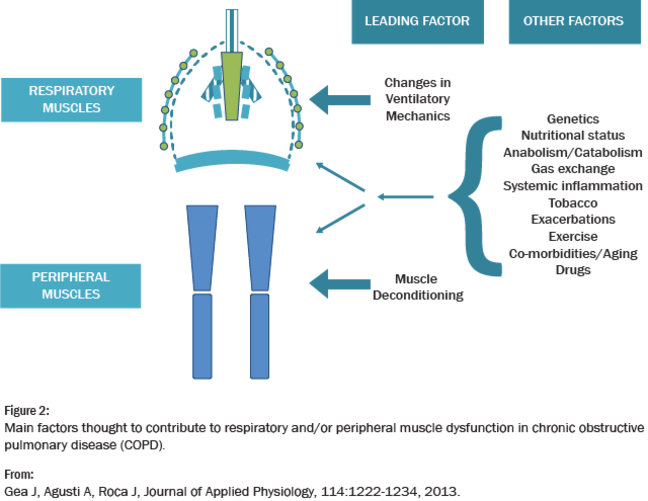 In addition to the damaging effect on the lungs, COPD contributes to skeletal muscle dysfunction which contributes to the exercise intolerance in COPD. This is characterized by a diminished peripheral muscle strength, muscle atrophy and muscle weakness. 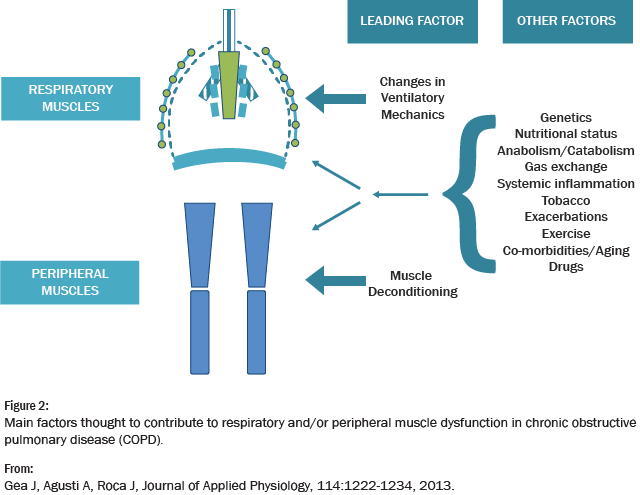 As you can see in the diagram below (Gea et al, 2013) lack of physical activity appears to be the main contributor to peripheral muscle dysfunction; whereas pulmonary hyperinflation seems to play the key role contributing to respiratory muscle dysfunction as mentioned above. 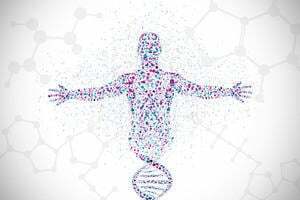 However, additional systemic factors, such as tobacco smoking, systemic inflammation, intense exercise, exacerbations, nutritional and gas exchange abnormalities, anabolic insufficiency, comorbidities and drugs also modulate muscle function. 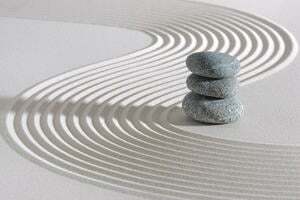 Major benefits of supervised exercise training include increased physical capacity, decreased anxiety about breathlessness, greater independence in daily activities, reduced fatigue and improved quality of life. These positive outcomes occur even though impaired lung function continues to persist after exercise training. In the next step we will be looking at exercise guidelines for COPD including inspiratory muscle training, neuromuscular electrical stimulation and high intensity interval training. However, in severe COPD the development of anaerobiosis does not show a disproportionate increase in minute ventilation. Thus, detection of a ventilatory threshold (the point at which ventilation starts to increase at a faster rate than VO2) may not be possible.